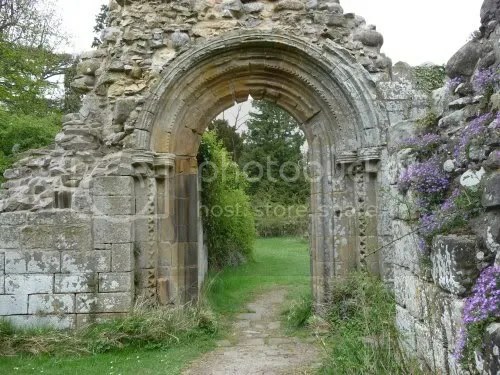 This month we’re visiting Jervaulx Abbey in North Yorkshire. Jervaulx is one of the few privately-owned Cistercian monasteries in the UK, and it’s one of those places you stumble over on a random Sunday afternoon drive. The abbey ruins are slap-bang in the middle of a field for grazing sheep, and the effect is very picturesque—which was the intention of Jervaulx’s 19th century owners, the Earls of Ailesbury. The first earl imagined the ruins as the setting for a romantic (and indeed Romantic) garden, and the proliferation of undergrowth climbing over the stonework has actually preserved rather than damaged it over the years. The lay brothers’ night doorway into the church. This is the oldest part of the abbey, dating from the mid-12th century.